“Hello Friends,”Jim Nance smoothly said to us at the Masters last week. Then, he dazzled us with sparkling tales of individual achievement by the players. Fittingly, this followed on the Heels of the NCAA National Championship, where it was the exciting play of the Nation’s top basketball teams that ruled the courts during March Madness. We are treated to the consummate play of teams and individuals at the top of their games during this precious time of year. And so it is with Maryland Defense Counsel and DRI all year long. As a team, we all spend our personal time and work hard together in these outstanding organizations. We do so as part of an effort to serve our Members, improve the law and promote a fair, efficient and just civil justice system. As individuals, we contribute as best we can as part of this work and, in Court, we also approach our respective cases with the same goals in mind. Together, we also champion causes like access to justice with Maryland Volunteer Lawyer’s Service and advancement of a superior judiciary through initiatives such as the National Foundation for Judicial Excellence. MDC stands stalwartly for judicial independence and in support of all people and institutions advancing Constitutional ideals. This has me thinking about how effective our team has been and continues to be during this very special 55th Year Anniversary Year. As one example of this, the Anniversary video, now in production, is being spearheaded by our stellar President Elect, Marisa Trasatti. All she and Bob Scott had to do was to ask DRI and DRI jumped in with both feet as an Anniversary Sponsor. 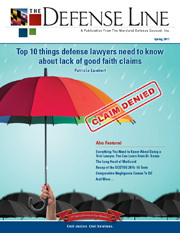 Please visit the Anniversary Firm Sponsor list on page 23 to acknowledge all of the law firms that are lending their hearty support to the Anniversary Year celebration and, of course, all of our sponsors on page 3. MDC is extremely grateful for their long standing stewardship. At the start of my journey as President last June, I quickly realized the value of our incredible Executive Committee team as they repeatedly put aside summer plans to endure phone calls and meetings to attend to some urgent and important MDC business when they had been told “the work really starts in September.” They include Marisa, John Sly and Dwight Stone, and also Nikki Nesbitt as Immediate Past President, Mike Dailey as DRI State Rep. and Kathleen Shemer, our incredible Executive Director. You have been innovative and resourceful leaders to a person. You are so good that, as President, often I feel like I am walking a big dog… you are leading me. I thank all of you and our illustrious, hard working Board for being there and excelling early and often. I am proud to be an individual on our fantastic team. The year started with a flurry of activity for Judicial Selections Chairman Tim Hurley and new Co-Chairman Winn Friddell, as they successfully enlisted the help of firms that graciously hosted interview sessions in or closer to the applicable jurisdiction, including: Miles and Stockbridge; Decaro, Doran, Sicillano, Gallagher & DeBlasis, LLP; Miles & Stockbridge, P.C. and Council, Baradel, Kosmerl & Nolan, P.A. Their judicial selections work is a valuable part of MDC’s work and quite a contribution to the bar and the judiciary. Thank you all for your time, hard work and painstaking decision making. Then, there was the grand finale of spectacular Past President’s Receptions on Tydings and Rosenberg’s beautiful Terrace. MDC thanks Tydings for hosting all of those great years, taking in that incredible view on (usually) gorgeous September evenings with good MDC friends, old and new! We will never forget them, even as we are making arrangements for this year’s Anniversary Past Presidents’ Reception. We have been told that this year’s Legislative Dinner was the best ever! Thank you to all that attended and participated. Working with the legislature and building relationships with members and other institutions is one of the finest things we can do at MDC. We welcome those that are joining the ranks of the legislative committee to do just that. The Legislative Committee has been working hard in Annapolis. Gardner Duvall, Nikki Nesbitt, John Sly, Mike Dailey, Ileen Ticer and John Stierhoff and Angel of our lobbying team, are seven individuals who have been making our MDC team look awfully good before the Maryland General Assembly. The PAC Chair, Katherine Lawler, and Treasurer, Colleen O’Brien do so much work behind the scenes that I hope they know how much we all value and appreciate them. The session just ended. But, it is not too early at all to acknowledge their efforts and thank them for their time and dedication. It’s not unusual to see one or more of them still in committee, waiting to testify at 8 or 9 at night. John Sly implemented regular legislative updates to the membership so that you know what legislative matters are brewing that may affect you and your practice. Look for those and the end of year legislative summaries now that the session has ended. These have been sent to you in the last few years as part of an effort begun by Semmes and now pursued by the whole legislative team. That’s not the only thing Semmes has begun. This year, they are stepping up to host the Trial Academy on April 24th. Semmes will bring this hallmark event to a very convenient and prominent downtown location. The Trial Academy is a herculean effort on the part of the phenomenal Programs and Sponsorships Committees’ which include Colleen O’Brien and Jhanelle Graham, Andrew Gaudreau, Richard Medoff and Chris Lyon. We at MDC cannot sufficiently express our gratitude and thanks to these folks, all of the coaches and volunteers who will participate this year and to Semmes for hosting this event. So many at MDC contribute time, hard work and dedication of firm resources to make our two-time award winning Trial Academy better and better every year. Please get the word out to those firms and attorneys who would be good participants and please plan to attend or contribute as well. Many more have contributed. Thanks to Miles and Stockbridge, Waranch and Brown and Semmes for hosting fall meetings last year. Thomasina Poirot and Caroline Willsey really gave the effort to engage and empower Young Lawyers a shot in the arm. Richard Flax, Chris Heagy and Derek Stikeleather did a wonderful job on Appellate Practice. Laurie Ann Garey and Leianne McEvoy have been doing great at publications, including this Defense Line. The Substantive Law Committee Chairs have provided great service on the Board throughout the year. Thank you! Things will not stop changing and MDC will be there “on it” as always thanks to each and every one of you. Just by way of example, you probably noticed the email from MDC crafted by Tracy Steedman, asking for your input on the possibility of Maryland adopting the Uniform Bar Exam. Tracy testified before the Court of Appeals on this crucial issue to all Maryland lawyers. Thank you Tracy. So, what can we do even better as a team? Allow me to tee up one idea. We could do as the preeminent Dan Karp, managing partner at my former firm, did when too long ago he came through the office door and shouted “sign everybody up for MDC and DRI!” I am in his debt because joining MDC and DRI opened up incredible opportunities for me almost right away. The time I have spent, the people I have met, the wisdom and training received and the experiences and good times I have had being involved with MDC and DRI will be cherished and appreciated as long as I am around. Think of all the futures you could change for the better by doing the same thing at your firm. Thank you for your time. 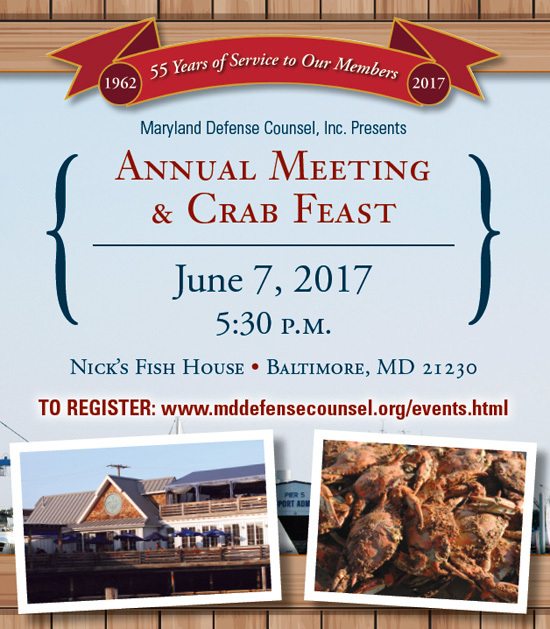 As always, we will wrap up the year at Nick’s at the Annual Meeting and Crab Feast at 5:30 on June 7th. I look forward to seeing you all there. In the meantime, we welcome the (hopefully) nice weather. Enjoy the green.